Enhance your home’s interior design with the CAE Single Lever Pull-Out Spout Kitchen Faucet. Finished with classic chrome, these kitchen faucets will never go out of style. These kitchen taps come complete with a pull-out spout for ease and convenience. Because these faucets are made by CAE, they’re durable and made to last. Would you like to add a classic touch to the interior design of your home? If so, you’ve come to the right place. 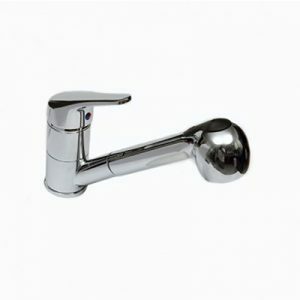 We are Fiberpol, and we are your source for high-quality kitchen faucets in Barbados. These CAE Single Lever Pull-Out Spout Kitchen Faucets are beautiful and functional. The chrome finish makes these faucets ideal for any kitchen design, and the pull-out spout makes it clean-up easy, now matter how many dishes are sitting in the sink.